At Modern Construction we follow a code of ethics, service promise and best price first guarantee to insure that we always lead with our best proposal. We focus on not cutting corners, not compromising and working with the client directly. When we sit down with a client we can back our work with years of experience and independent testing that goes much higher than the industry standard. When you work with Modern you work directly with the owner and the design team. There is a no obligation/no charge sight evaluation, preliminary blueprint and preliminary estimate using your custom floor plan design for your lot/site. We even encourage you to compare your estimate with Modern to other builders to ensure we are the best choice. We have worked with clients who come with very challenging ideas and sites. No matter what the challenge we will honestly address the situation and look for a solution. Clients have come to Modern with difficult lots, challenging grades, soil corrections, unique home plans, drainage challenges, power line issues and the need for variances. Modern uses BuilderTrend software for scheduling and product approval so you have direct access throughout the entire building process to view the exact stages & products of your home. Several site visits will occur including a framing walk-through which allows home-owner to place all electrical switches, lights, island placement, flooring transitions, shower fixtures, blocking for TVs, etc. Within the walk-through there is opportunity for the home-owner to address design modifications at almost any stage in the project. As the project transforms from paper to reality Modern understands that adjustments may need to be made to accommodate the client at a more personal level. Final walk-through when your home is finished, which includes everything you need to know about your new home. A 30 or 45 day follow-up inspection (depending on the season) of your home. This is to handle any warranty issues....Are there any settling concerns, do we need to adjust a drawer or two, etc. And, finally, a 1 year follow-up inspection. At this inspection we can see what happens to your home after it goes through a full freeze/thaw cycle. We want to ensure that you love your home, that everything functions to your standards, and that all your questions are answered. Our home warranty that is not only among the best in the business, it is higher than the state requirements most other builders follow. Continued client relationships and outstanding referral recommendations push Modern Construction forward ahead of the competition in innovation, energy efficiency and custom design. The focus on building smarter, better products and customer service shows the integrity & expectations Modern sets for the industry. The culture of this company is defined by the character of the management not the bottom line. We are committed to our customers and their families, the environment and our community. We absolutely treat every customer with the respect they deserve and stand behind everything we do - long after the work is done. We understand that hiring a builder is very personal and we want to give you the building experience very few other companies offer. That is the Modern Difference. This product is an ALL-IN-ONE building material. It is designed for 5 major construction issues: wind resistance, thermal breaks, sound transmission, structural strength and fire/life safety. Modern Construction has completely moved to building exclusively with T-STUD technology. Homes built with this product are 30% more efficient than standard building materials. Mechanical systems installed in Modern Construction homes are among the best in the nation. They focus on renewable resources, upgraded air purification, zoned HVAC and utilize touch screen programmable controls. 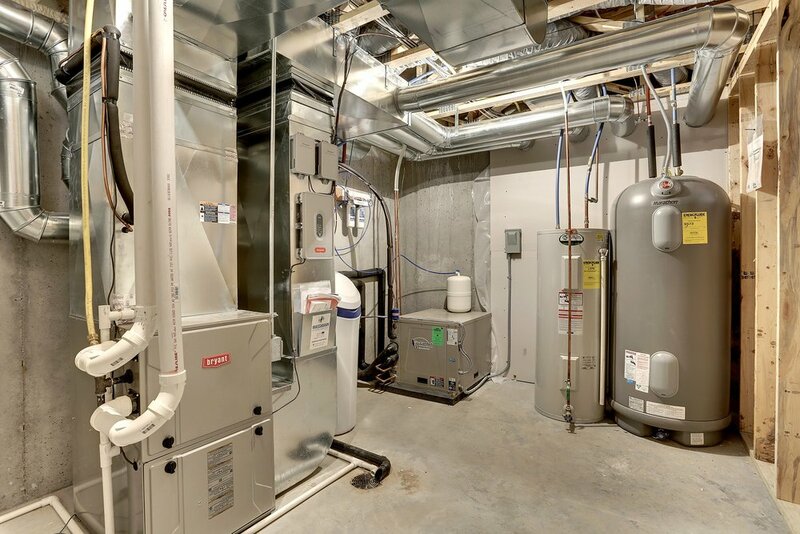 This room highlights a Geothermal heating & cooling system, storage tank water system, water purification system (reverse osmosis), zone furnace, water softener, upgraded air-filtration system, humidifier and air exchanger. This particular home is built slab on grade. We used non-traditional footings for this build that prevents the ground beneath the house from freezing. This type of construction also saves the home-owner money by not constantly having to warm frozen ground. Ground settling is also not an issue in this type of build. Modern Construction offers partial or full house spray foam packages. Closed cell spray foam is widely regarding as the best insulation product. It reduces cost while also adding strength and rigidity to your home. An upgraded air filtration system is installed in every home utilizing the best air filters for the highest air quality to decrease dust and allergen exposure. Jesse Hartung, President and founder of Modern Construction of Minnesota, Inc., started in the construction industry more than 15 years ago after spending 4 years in the Army's 82nd Airbourne Unit and The Minnesota National Guard. While in the Army he gained a sense of integrity, a hard work ethic and strong leadership skills. Jesse has a strong sense of commitment to his customers and stands by his word. His creativeness and dedication to details places Modern Construction of MN, Inc. a step ahead of their competition. Customers return to Modern because they value the dedication Jesse brings to every project.